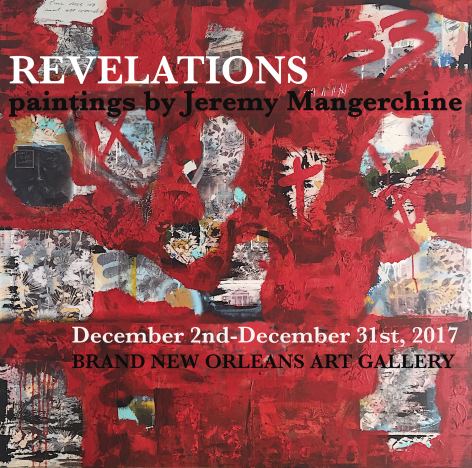 Brand​ ​New​ ​Orleans​ ​Art​ ​Gallery​ ​is​ ​proud​ ​to​ ​present​ ​​Revelations,​ ​a​ ​solo​ ​exhibition​ ​of​ ​paintings​ ​by​ ​local artist​ ​Jeremy​ ​Mangerchine.​ ​​Revelations​​ ​will​ ​open​ ​at​ ​the​ ​Brand​ ​New​ ​Orleans​ ​Art​ ​Gallery​ ​on​ ​December​ ​2 and​ ​run​ ​through​ ​December​ ​31,​ ​2017.​ ​This​ ​exhibition​ ​is​ ​an​ ​official​ ​satellite​ ​location​ ​of​ ​Prospect.4​ ​New Orleans,​ ​a​ ​citywide​ ​triennial​ ​of​ ​contemporary​ ​art. 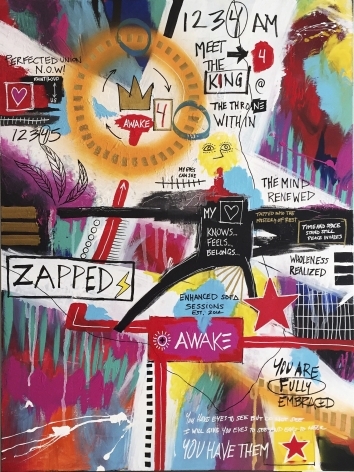 Jeremy​ ​Mangerchine​ ​is​ ​a​ ​New​ ​Orleans​ ​based​ ​visual​ ​artist.​ ​Having​ ​grown​ ​up​ ​in​ ​multiple​ ​cities​ ​and​ ​traveled the​ ​world,​ ​Jeremy​ ​has​ ​a​ ​unique​ ​blend​ ​of​ ​inspiration​ ​that​ ​heightens​ ​his​ ​vibrant​ ​style.​ ​His​ ​work​ ​delves​ ​into exploration​ ​and​ ​discovery​ ​of​ ​the​ ​layers​ ​within​ ​his​ ​person​ ​by​ ​pulling​ ​out​ ​the​ ​deepest,​ ​life​ ​infused​ ​feelings and​ ​ideas​ ​and​ ​placing​ ​them​ ​intuitively​ ​on​ ​the​ ​canvas​ ​to​ ​dramatically​ ​impact​ ​the​ ​viewer.​ ​With​ ​a tremendously​ ​optimistic​ ​outlook​ ​on​ ​the​ ​limitless​ ​possibilities​ ​of​ ​life,​ ​Jeremy​ ​weaves​ ​inspiration,​ ​hope​ ​and a​ ​intuitive​ ​sense​ ​for​ ​what​ ​is​ ​possible​ ​into​ ​his​ ​works. 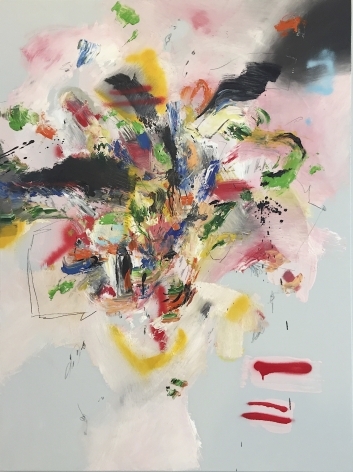 Revelations​​ ​is​ ​an​ ​exhibit​ ​that​ ​plays​ ​on​ ​art​ ​historical​ ​modernism​ ​and​ ​involves​ ​the​ ​human​ ​psyche.​ ​The artists’​ ​intuitive​ ​nature​ ​of​ ​covering​ ​and​ ​exposing​ ​the​ ​layers​ ​of​ ​his​ ​work​ ​hints​ ​at​ ​the​ ​complex​ ​nature​ ​of​ ​how we​ ​as​ ​humans​ ​decide​ ​what​ ​to​ ​present​ ​to​ ​the​ ​world.​ ​It​ ​is​ ​dependent​ ​on​ ​viewer​ ​interpretation​ ​to​ ​determine the​ ​truth​ ​in​ ​what​ ​is​ ​shown​ ​and​ ​ponder​ ​about​ ​the​ ​details​ ​that​ ​may​ ​be​ ​dwelling​ ​underneath.​ ​In​ ​conjunction with​ ​P.4​ ​​The​ ​ Lotus​ ​ is​ ​ Spite​ ​ of​ ​ the​ ​ Swamp​,​ ​Mangerchine​ ​displays​ ​the​ ​creative​ ​forces​ ​inside​ ​the​ ​artist’s mind​ ​and​ ​the​ ​triumph​ ​of​ ​the​ ​human​ ​spirit.​ ​The​ ​result​ ​is​ ​a​ ​show​ ​that​ ​is​ ​not​ ​just​ ​visually​ ​pleasing,​ ​but​ ​also spiritually​ ​contemplative. 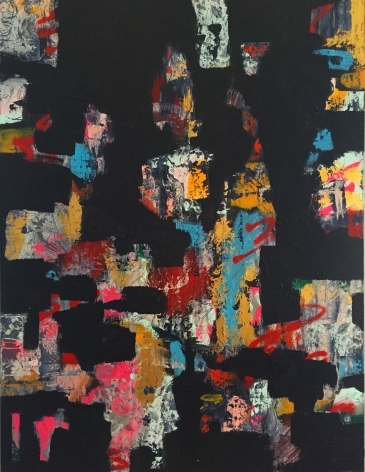 Been​ ​ Seeing​ ​ You​ ​ Go​ ​ will​​ ​open​ ​on​ ​Saturday​ ​December​ ​2,​ ​2017​ ​with​ ​a​ ​reception​ ​from​ ​6-9​ ​pm​ ​during​ ​the Arts​ ​District​ ​of​ ​New​ ​Orleans​ ​“First​ ​Saturdays”.​ ​There​ ​will​ ​be​ ​live​ ​music​ ​preceding​ ​the​ ​opening​ ​from 1-3pm​ ​by​ ​local​ ​musician​ ​Taylor​ ​Ott​ ​as​ ​well​ ​as​ ​appearances​ ​by​ ​performers​ ​of​ ​the​ ​Sylvain​ ​Society​ ​and​ ​The Merry​ ​Antoinettes.​ ​The​ ​exhibition​ ​will​ ​be​ ​on​ ​view​ ​through​ ​December​ ​31,​ ​2017.